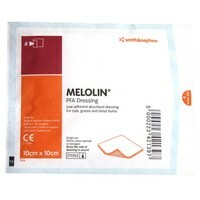 Smith & Nephew Melolin Wound Dressing can be used to dress minor cuts, abrasions and burns, providing a protective environment against bacteria and further infection. This dressing can also be used as a primary contact layer to dress slightly deeper wounds, so long as it is supported by a second, more absorbent dressing. Each dressing measures: 10cm x 10cm.